Now, as Bill Cosby used to say, I told you that story to tell you this one. I recently did a post on the Dark ‘n Stormy, which referred back to my post in January on the Bacardi Cocktail. The latter post started out a little schitck about the Cocktail Whose Name Must Not Be Spoken. Well, for some reason, the last week has brought a whole bunch of hits to this site from Google, with search terms like He Who Must Not Be Named Cocktail , as well as other, more obvious search terms like, Volde…. Stop! Just Stop! You can’t say that! You know, the search term you were about to write. Because it contains You Know Who’s name! You can’t just go around writing that out in public, or even in private! You want to get everybody around killed? Hey, what’s with the hat and stick? What are you up to? I’m going to a costume party! Yeah, that’s it. A costume party? Why was I not invited? How was I not invited? Anyway, the search term was Voldem…. Shut up. 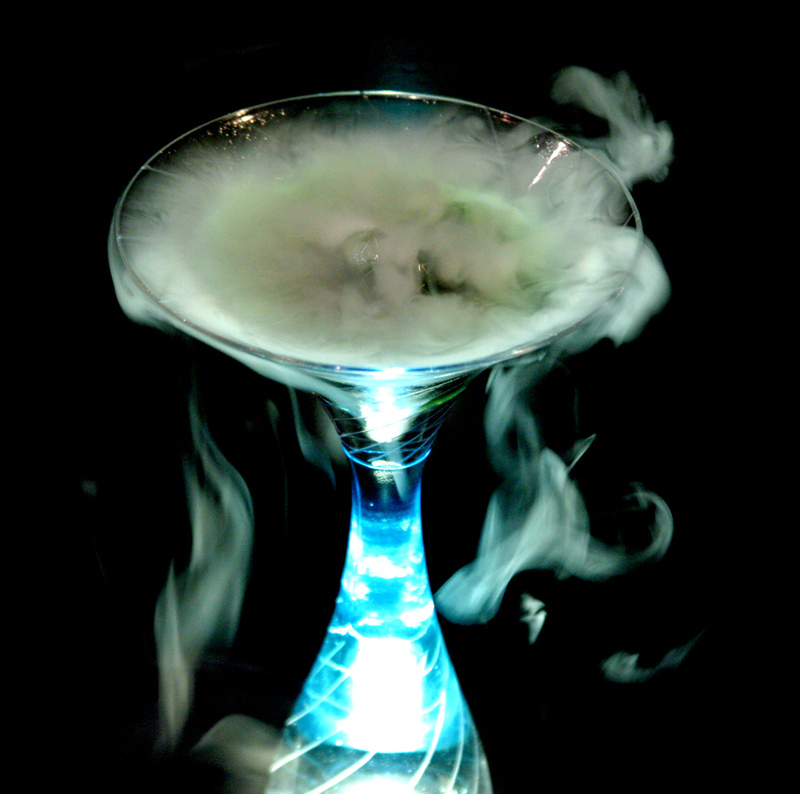 Voldemort Cocktail . Anyway, Dr. Bamboo put Voldem… if I just say, You Know Who Cocktail from now on, will you come back? Dr. B coined the term in the comments, and now every Harry Potter fan of age and cocktailian inclination is headed to this blog. Fun huh? But it isn’t enough. I now need a real Volde— You Know Who Cocktail, and I have successfully created one. It is dark, and pungent, and dangerous, and while it has a taste that is definitely not for everyone, it ain’t half bad. Combine sambuca, absinthe, and gin in a shaker with ice and shake well. Strip off a wide band of lemon peel with a vegetable peeler and twist over a chilled cocktail glass to express the oils. Drop it into the glass, along with a chip of dry ice and the bitters. 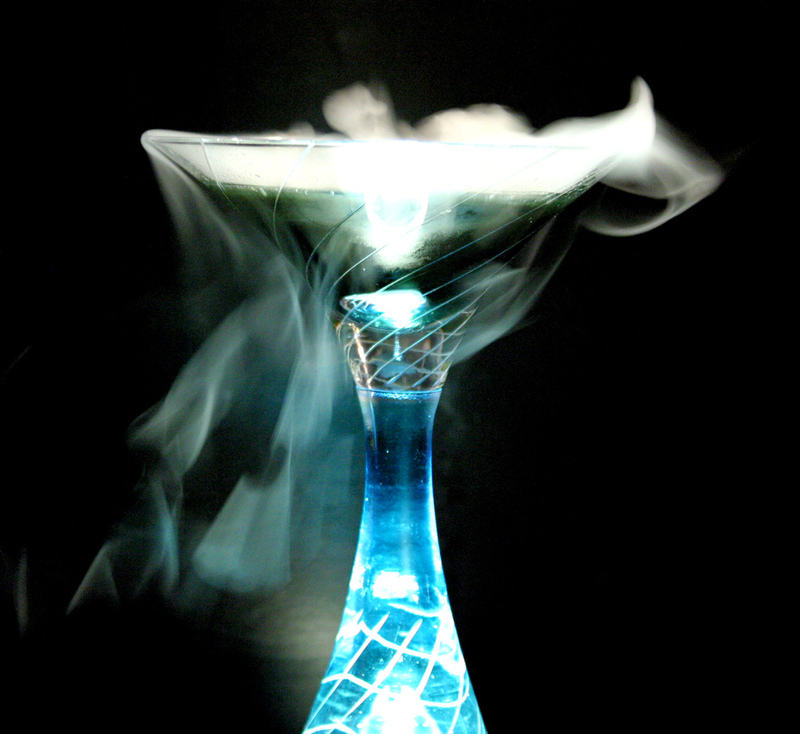 Strain potion cocktail over the top and serve while dangerous. This is far sweeter than any cocktail I have ever made before, but even I kinda like it. If you make it, let me know. Just be careful what you call it! A last note here, as an alternate presentation. Take a large, round scoop of chocolate ice cream, make an indentation in the top, and fill with the Voldemort You Know Who Cocktail (minus the gin). Still use the dry ice if you have it. And thanks for the visits, Harry Potter fans! That looks genuinely awesome, Doug.